What is a Power Port?? 3BR Powersports brings compact, splash-proof power ports to the powersport vehicle world. 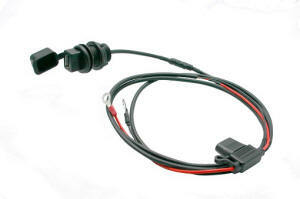 If you are looking for a power port sized for your GPS, radar detector, comms system or other low power accessories a 3BR Powersports power port is the answer. Whether you ride a touring motorcycle, Adventure Bike, cruiser, ATV, or Snowmobile; Baryl™ power ports are built to take all of the punishment your ride can dish out. Unlike most Powersports, 3BR Powersports patented seal design keeps out dust and water when in use. No more seal caps that have to be opened or removed to plug in your accessory. 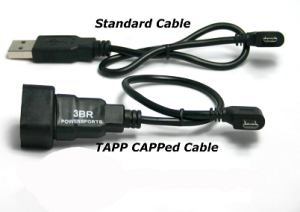 3BR Powersports USB power cables have special circuitry inside to allow Garmin™ GPS such as the Nuvi® to operate while charging. These cables have the same function as the Garmin power cable that has the cigarette plug at one end. 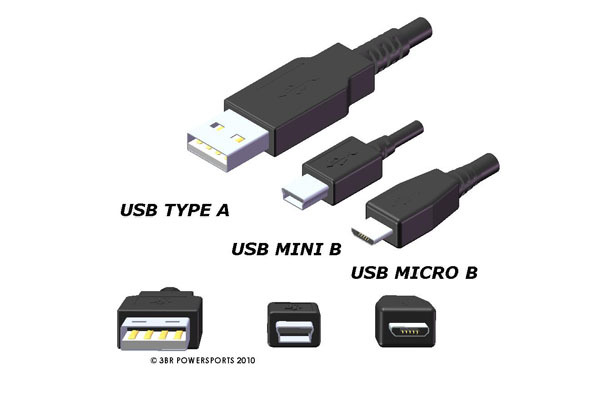 Cables are USB Type A to USB Type B Mini Right Angle Up. Note: this is power cable, not a data cable. It cannot be used for data transfer. Installation kit includes 3BR Powersports Universal Mounting System. Weatherproof up to full water wash down. 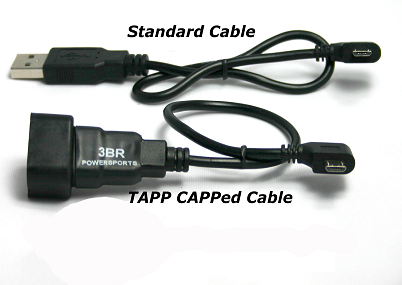 Mates with 3BR Powersports patented TAPP CAPP™ weatherproof USB cables and caps for weatherproof cable connection. Powers: Tablets including iPAD, most cell phones & smart phones including Android cell phones and smart phones, Apple, Samsung, Motorola, & LG. Also most GPS, Apple iPod, and any other device that charges using 2.1A or less of USB power. Note: some Blackberry and Casio devices require a special charging cable. Note: will not charge Samsung or ASUS tablets which require proprietary chargers. 1 Panel Tapp USB assembly, 1 Posi Tap Quick Cap and 6 cable ties. First Step: Find the location that best fits your needs on the sled allowing at least 2" clearance behind the panel to allow cable routing. Drill a 7/8" hole in the panel with a small hole saw or step drill bit. 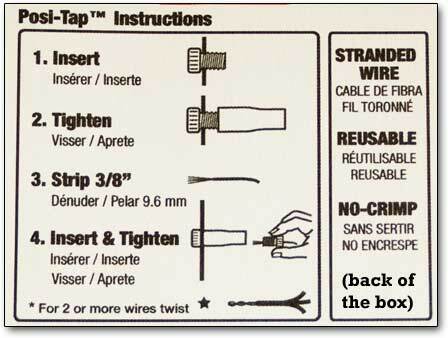 Then install your panel tap and be sure the seal cap has ample room to open. 2nd Step: Take a close look at where you would like to tap in for power. 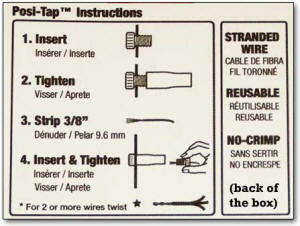 We decided to tap into the 12V accessory plug that was provided using the Posi-Tap into the white wire. As you can see by the pics we routed the wires down along the plastic radiator scoop on the left side of the sled and followed the lighting harness over to the right side and back up the scoop to the Panel Tap. Finally: If you look at the final pics you will see how nice the install looks over all. The weather proof cap is easy to open and the GPS plugs in with no problem. With standard cords your GPS goes into data mode, but not with the 3BR Powersports cables, it stays into power mode just as it would in your vehicle. If you need longer cords for taller risers... 3 BR Powersports is well equipped with many different length cords..
Any questions feel free to email the Webmaster. Totallyamaha is not responsible for any damages that these modifications may cause to your vehicle; any modifications are your responsibility if you choose to do so. We are providing information ONLY. Some of these modifications may VOID your warranty and that is your responsibility to look into. The Totallyamaha users have passed along most of the information found on this site. If you have any questions or concerns about anything on this site talk to your dealer before using any of the information. Totallyamaha will not be liable for any damages or personal injury from any modification performed from this site.